All my life, Iâ€™ve considered myself to be crafty-adjacent. My mother and older sister, on the other hand, are sewinâ€™ and decoupaginâ€™ machines. I cherished â€˜craft nightâ€™ growing up, but often times my projects looked more like what we know today to be "Pinterest fails.â€� When I first started looking into environmentalism, finding sustainable fabric at big box stores was next to impossible, and all of the glue, rhinestones, and stamp ink of yesteryear started to look like trivial pollution. Part of me was relieved that crafting was out of my life. Then, I discovered the world of upcycling. The stakes are still the same: if I mess up, Iâ€™m still dooming something to storage or worse, a landfill. But the creativity of it, the potential, is far greater and that pushed me to flex whatever craftiness was in my DNA. Since then, Iâ€™ve reupholstered chairs with velvet tops bought off DePop and hand-sewn cloth pads out of flannel shirts from Goodwill. If my favorite tartan ruffled maxi skirt ever loses its luster or suffers an inoperable tear, it will become a fleet of scrunchies. Above all, my favorite thing to make is a good bag. And that brings us back to the plight of ten-year-old me: sewing machines are not my friend. At least, they werenâ€™t â€” but more on that later. Last month, after cruising Moda Operandi and Shopbop one too many times, I became obsessed with the bucket bag. They were everywhere, from high-dollar brands like Simon Miller to mainstream retailers like Urban Outfitters. But one thing they were not was vegan, let alone sustainable. So, I did the next illogical thing, I bought two sets of vintage purse handles from Etsy. You know, like how you buy a gym membership to force yourself into a healthier lifestyle. The handles on my nightstand now dared me, make us into something or be wasteful. At the same time, the Selva Scouts â€” our online, eco-conscious scout program â€” were gearing up to earn their second merit badge: the Fashion Mender. With my craft-redemption story taking shape, I asked the Scouts to vote on their favorite handle: a translucent red or blue marble. By a narrow margin, the blue handle won. Then, I scoured our editorial closet and found two shirts, a pastel rainbow and a gingham, that we had high hopes for but never made it in front of a camera. We took to Instagram to ask our followers to choose between the shirts. 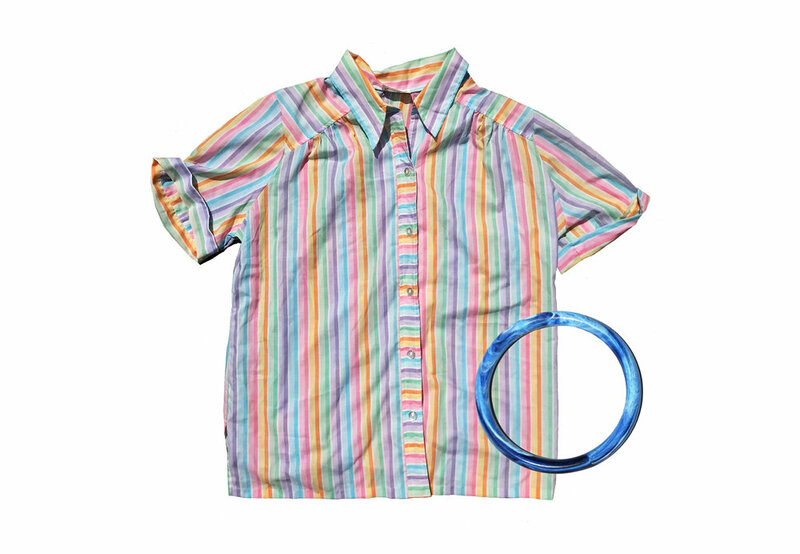 The rainbow button-up won by a landslide and we had the beginnings of our bag. Given my track record with sewing machines, I knew that I would need help and thankfully Vanessa Villalva â€” experienced seamstress and co-owner of Ronkita Custom Sewing and Design â€” was down to show me how this bag could be made. On a scorchinâ€™ Monday morning, I visited her home studio to learn and watch her work. Though I initially wanted this bag to be of the â€˜miniâ€™ variety, Vanessa aptly pointed out that the handles I bought were for a much larger bag. Oof. She then made three prototypes of varying sizes out of muslin and we settled on the largest variation. Interestingly, most of the time spent making this bag was taken up with thoughtful precautions like measuring (and re-measuring) or pinning the fabric before running it through the machine. I wouldnâ€™t say this bag is necessarily for beginners, but I was shocked at how swiftly it actually came together. Vanessa is a real expert and made this piece in two hours â€” even with me stopping her every ten minutes to take photos. If you know your way around a sewing machine, Iâ€™m positive that you could knock this baby out in an afternoon with the help of a circular ruler and some other tools. Perhaps more shocking to me, though, was how quickly I acclimated to the machine with proper instruction. Granted, I only helped with a few seams, but I did learn that making a purse is mostly having the foresight to tackle your construction properly â€” something that improves with each new project â€” and the actual sewing itself isnâ€™t so daunting. In that way, sewing is way more universal than making a collage or painting a vase, and thatâ€™s pretty empowering for those who, like me, have been burned metaphorically and literally by a hot glue gun or two. As good stewards of the planet, we have an obligation to thrift and preserve what we have, instead of buying new. But that moral imperative can often feel like a burden, especially if youâ€™re not equipped with the figurative and practical tools to make it a lifestyle instead of an occasional sacrifice. So, Iâ€™m daring you now to fill your proverbial tool bag as best you can â€” whether that means joining the Selva Scouts, seeking out an instructor like Vanessa, or educating yourself with YouTube videos. Ultimately, I hope that the biggest lesson you learn is that thereâ€™s so much potential for the millions of secondhand garments that flood thrift stores each year. Todayâ€™s $4 vintage shirt really can be tomorrowâ€™s designer handbag, even if the Pinterest gods laugh at you from time to time. Featuring Sarah Brown. Photography and makeup by Magdalena AntuÃ±a. Styled by Meggie Copeland. Creative assistance by Victoria Jameson. Styling assistance by Kasi Martin. Follow Ronkita on Instagram here.